Item is a photograph of a senior couple seated at a dining room table. Enclosed caption reads: "The holidays are a good time to photograph people together and capture the warmth of family relationships." Item is a snapshot photograph of a man and a woman standing in front of a house where guests dressed formally scatter the patio. Inscription on verso reads, 'Betty Bowker Slaudish Wedding'. Item is a grey card with brown letterpress, along right side, cropped off at edge, "Nap. Bellange-". 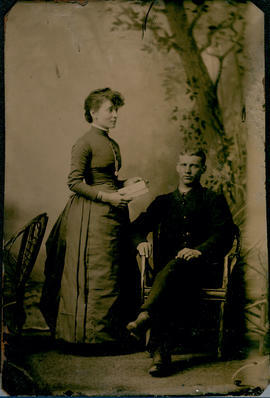 Photograph shows a young man and woman. On verso, in red ink, "Patrick/ Maggie(? )".